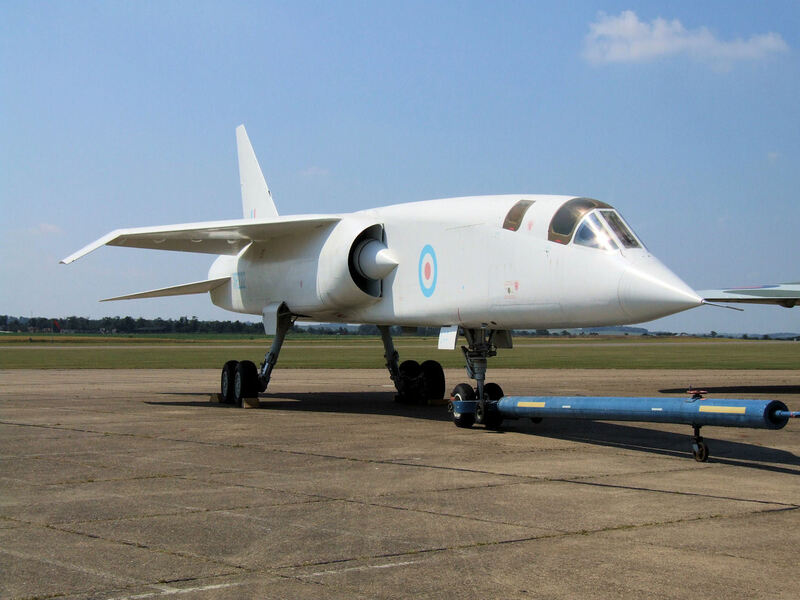 Following submissions in 1958, the Tactical Strike and Reconnaissance, Mach 2 (TSR-2) development contract was awarded to Vickers, with English Electric as a sub-contractor. It was envisioned as a low-flying strike aircraft capable of penetrating enemy territory at near Mach speeds below 200 ft and attacking using internal weaponry within a 1,000 nautical mile radius (1,900 km). It would also have the possibility of flying high and fast in a secondary reconnaissance role. The TSR-2 was conceived without prototypes, nine airframes to be gradually corrected and retrofitted before full production. The first flight took place in September 1964; on the second, fuel pump vibration at the human eyeball’s frequency obliged the pilot to throttle down. The landing gear only retracted on the 10th flight, then showed dangerous oscillation during lading – making strengthened struts necessary. This aircraft’s capabilities were designed to target missile sites, airfield installations, supply depots, railways, and similar targets using tactical nuclear bombs. It was extremely advanced in its time, and much know-how and expenditure was put in its production. Its use would have given Britain the cutting edge aeronautically. For example, a forward looking radar and side-looking radar as used on the TSR-2 were not common until some years later. The TSR-2 was also an impressive airframe capable of dashing at Mach 2.35, and was said to compare to a Lightning in handling. Nevertheless, development proved difficult, squabbling put the neccessity of this airplane in doubt, and costs mounted always upwards. The program was cancelled in 1965, and with it, Britain’s occasion for the top tier in aeronautics. However, the program had proven too costly to the government, and all airframes except two were either scrapped or sent to the shooting range. During its short existence, Australia manifested acute interest in purchasing the plane. Instead, in Australia as in Britain, the American F-111 was opposed as a cheaper alternative. Though the F-111 was not originally equal to the TSR-2, and proved to be a decade late and much pricier, there was no longer a viable alternative. In Britain, the SEPECAT Jaguar took on the corresponding role, later followed by the Panavia Tornado – some of its avionics being derived from the TSR-2 project. The engines powering the TSR-2 were developed into those that powered the Concorde. To fly close to land, the TSR-2's wings were much smaller than usual, the higher wing loading shielding the aircraft from the adverse effects of wind and thermal disturbance. The turmoil about the TSR-2 resembles the cancellation the the equally ambitious Avro Arrow, plagued by similar political problems. Unless otherwise mentioned, this webpage and its content is licensed under the Attribution 4.0 International license. You may quote and copy this material if you give correct credit to the author and do not distort or otherwise change the original meaning of his words. Copying any material on this website without giving correct credit to the author is both plagiarism and copyright infringment, and will be treated as such. Denis G. Labrecque published this document on July 07, 2016. Proudly hosted on GitHub using Jekyll markdown.